Norbar’s PTM/E series of Powered Pneumatic Torque Multipliers are purposely designed to be amongst the lightest and fastest on the market today. The 52mm diameter gearbox means that the Powered Torque Multiplier is lightweight and easy to manoeuvre. The PTM-52 series have a fast operation for rapid bolt run-down with some models generating a free speed 175 rpm. Low vibration levels also make these tools comfortable and safe to use. Fast – capable of achieving free speeds between 70 and 140 rpm. Quiet – less than 85 dB(A) when in use. Low vibration levels – make the tool comfortable and safe and easy to use. Internal Control (IC) models incorporate torque transducer, torque setting and display panel and solenoid valve to shut off the air supply at the desired torque. External Control (EC) models incorporate torque transducer and output for an external controller. Best suite for production/assembly lines. Purpose built to meet the needs of the commercials vehicle market. 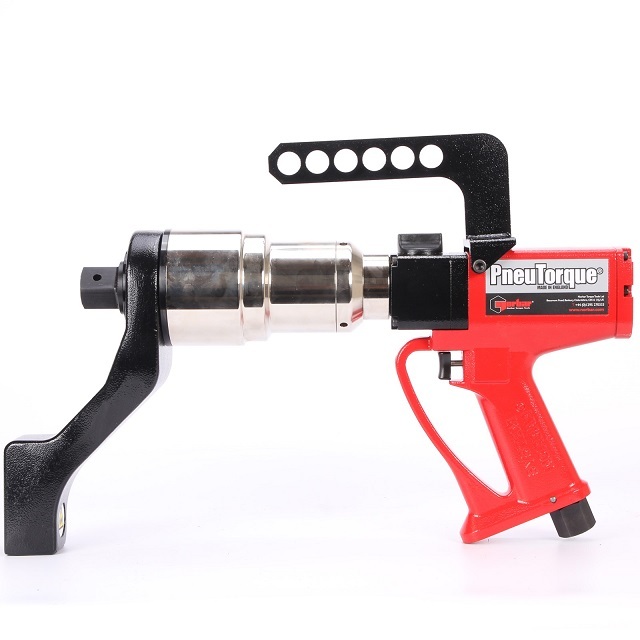 The specially designed reaction foot of the PTME-72 series of tools is able to better access recessed wheel bolts whilst the 72mm diameter gearbox handles the high frequency of use demanded by busy tyre shops. The 2700 Nm version has a free speed of 46 rpm for rapid bolt run-down. Lightweight – all models are fitted with a light yet sturdy aluminium reaction plate. 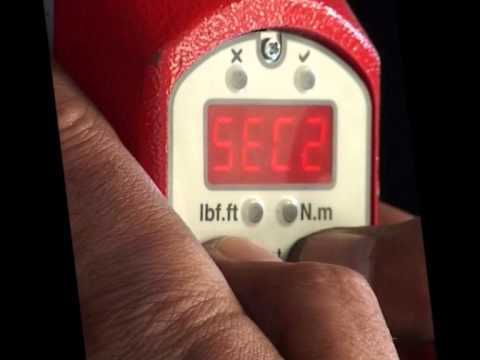 Quiet – noise levels register at less than 85 dB(A) when tool is in use. Gearbox rotates independently from the handle to prevent operator injury. A second trigger located on the back plate requires the operator to use both hands to operate the tool. In this way the risk of the operators hands getting trapped between the reaction bar and reaction point. Engineer to Order reaction accessories are also available upon request. All the above are supplied with a ¾” square drive (Part No. 18544). *IC and EC tools are not supplied in a carry case. 18140.B06 PTME-72-1000-B Bi-Directional ¾” sq. dr.
18149.B08 PTME-72-1000-B Bi-Directional 1” sq. dr.
18141.B08 PTME-72-2000-B Bi-Directional 1” sq. dr.
18142.B06 PTME-72-1000-B-IC Bi-Directional ¾” sq. dr.
18143.B08 PTME-72-2000-B-IC Bi-Directional 1” sq. dr.
18144.B06 PTME-72-1000-B-EC Bi-Directional ¾” sq. dr.
18145.B08 PTME-72-2000-B-EC Bi-Directional 1” sq. dr.
ordering. Stall tools are supplied in a carry case.